Teachers Jerome Wallace & Helen M. Crombie. Back Row: Jim Kelly, Billy McDowall, Andy Seaton, Jim McKnight, Tom Thomson. Middle Row: Mr. Wallace, Hugh Hardie, John Kelly, ? 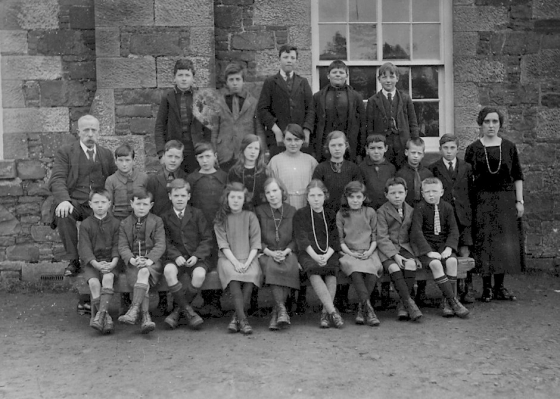 McGrady, Molly Crichton, Nellie McMillan, Sadie Caig, Rab McCreadie, Billy McGuire, Ed Seaton, Miss Crombie. Front Row: Davie McGuire, Alex Forster, John Kevan, Mary Fraser, Lizzie Cronie, Jean Graham, Grace Fraser, Crack Cronie, ? Wilson. This entry was posted in Missing Persons, People, School and tagged ? McGrady, Alex Forster, Andy Seaton, Billy McDowall, Billy McGuire, Crack Cronie, Davie McGuire, Ed Seaton, Grace Fraser, Helen M. Crombie., Hugh Hardie, Jean Graham, Jerome Wallace, Jim Kelly, Jim McKnight, John Kelly, John Kevan, Lizzie Cronie, Mary Fraser, Miss Crombie, Molly Crichton, Mr. Wallace, Nellie McMillan, Rab McCreadie, Sadie Caig, School, Tom Thomson, Wilson on October 21, 2011 by Neale.